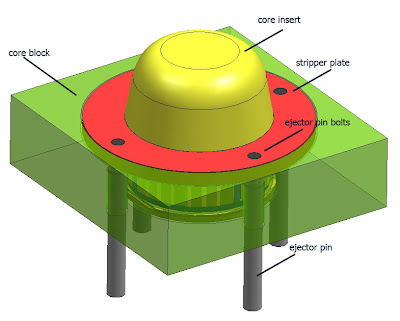 those plate main function is to push product when ejecting, isn't need much part of plate surface that contact with bowl surface, only 0,8 mm product will able to eject from core insert side. below is picture and some explanation where and when we set the clearance between insert part. 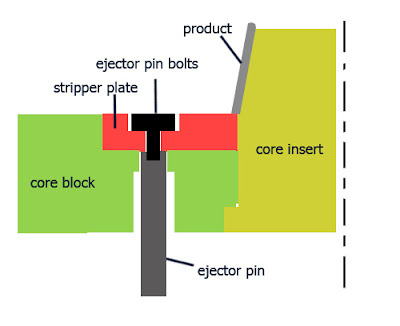 1. between insert core and core block, fit tolerance about 0.010 mm with height about 15mm from parting line, and after that make clearance about 0,5 until 2 mm. 3, between stripper plate and insert core, give it fit tolerance about 0.005 mm until 0.010 mm, it to prevent plastic product flash. 4. between ejector pin bolts and stripper plate, give it free tolerance from 0.5 mm until 1 mm. 5. ejector core pin and core block, give it fit tolerance about 0.010 in top side with height 10 mm, after that give free clearance about 0.5 mm in each side.